My mom hurt her arm exactly 7 weeks ago (she reminded me today). She is doing well, although she hates the medical profession. My mom says this is one time she misses Seattle. She loved the health care system. She’s going nuts trying to deal with the paperwork and the physical therapy people. I can tell. She’s swearing a lot. My foster dad sent some photos to my mom. 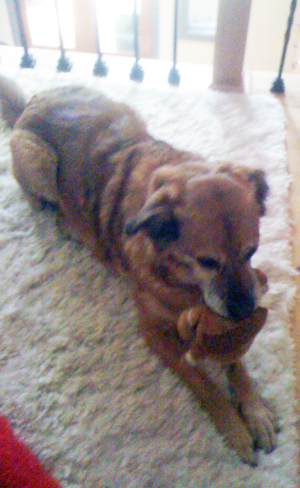 Here I’m chewing on my chew toy … and dreaming of how I am going to torture my mom again. I may be just a dog but I can tell: something is up! A dog who knows words? Who cares? My mom just read me this article from the New York Times. Sit. Stay. Parse. Good Girl! Apparently there’s a border collie on the East Coast who knows over 1000 words. Who’s kidding who? I never feel like an underachiever. I am a Canine Urban Princess – a CUPPIE in good standing. I don’t need to learn all those words. I just follow Cathy’s actions. In fact, I am actually almost psychic. Yesterday my mom was going out in the evening. She just signed up to take an improv class up at Jet City Improv. Fortunately I can’t go because I realize this is yet another activity at which my mom will fail to excel. So far, there’s been pottery, dancing and now…acting. She just doesn’t know when to quit. But I digress. We went to the park around 3 PM. My mom urged me to run and play, even though there weren’t any other dogs worthy of my attention. And I’m not getting any younger. Even our good friend Lindsay noticed I’m getting more gray around the muzzle. Okay, I got in a few sprints. But I’m conserving my energy for tomorrow’s trip to the good park with my Aunt Sara and the nice dogs in my regular pack. So we went home and my mom pretended to work at her computer. I can tell because while she works I sleep on my special cushion, right behind her. The fat Ophelia sleeps right next to me on a separate cushion. I wasn’t fooled. I knew this was a Walk Before Gracie Goes Into The Crate. So as we walked home I dug in my paws and looked stubborn. Everybody passing by made a wisecrack, like, “Who’s walking who?” and “Doesn’t want to go home, does she?” Some people thought I was cold and didn’t want to be out walking. Although I thoroughly embarrassed my mom, I still had to go home and yes, get stuffed in my crate. My mom put some peanut butter in my kong toy but I wasn’t fooled. I knew I was in for a few hours of serious crate time. Yeah, right. I think she’s reassuring herself. As soon as she closes the door, I scarf down the peanut butter and go to sleep. When she comes home, I’m out of the crate, tail wagging, ready to settle down for the night on my mom’s bed after our final, final walk, which I enjoy immensely and never argue about. See, I know? It’s a tough life but at least I can read between the lines. 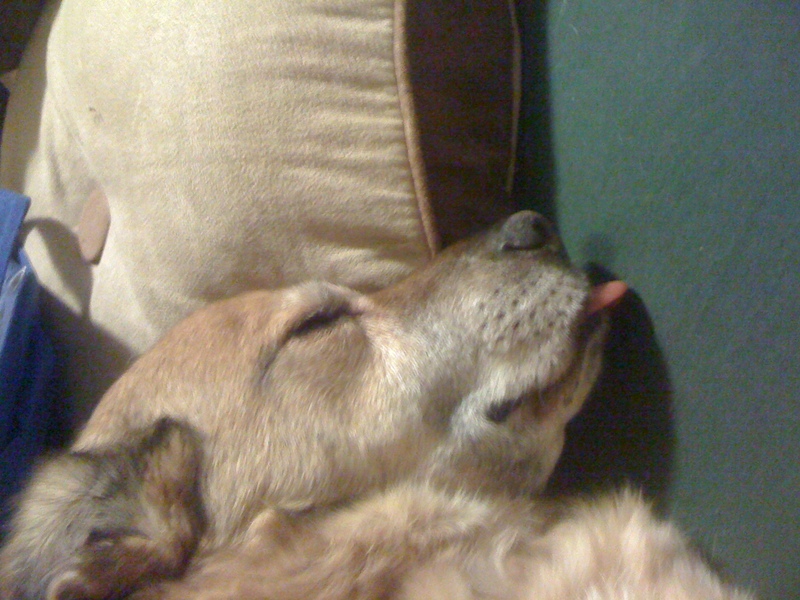 Posted on January 20, 2011 March 10, 2011 Categories A Dog's Life, apartment, city dogTags dog owner, dog's lifeLeave a comment on A dog who knows words? Who cares? My mom Cathy thinks she should get a tax deduction for me: my food, treats and vet bills. She points out that I am an asset to her health and her business. I force her to take walks in the fresh air. I insist that we take regular breaks. And I am her muse and source of inspiration. Now my mom has yet another reason to believe dogs are good for business. Her business friend Pamela Bruner just wrote a blog post about dogs as motivators. It seems that Pamela’s dog Kaylee needed surgery to alleviate a painful knee. (You didn’t know dogs have knees? Now you know.) Pamela realized she had a motivation to keep earning higher levels of income, so she would always be able to say “yes” when a vet asked if she could afford the surgery. Dog surgery doesn’t come cheap. In fact, my mom sighs, there’s nothing cheap about a dog. Walking. Boarding. Feeding. And more. “If I didn’t have a dog, my life would be simpler,” she says. Good grief. Imagine life with Ophelia as the main pet. Be thankful for me, mom! Well, I guess my mom can relax a little more when I go out. The folks at dog.com sent us a new door for my crate, with a latch that closes nice and tight. I can feel secure! My mom managed to unwrap the package. Then she looked at the old door. Fortunately my mom was out this morning when my Aunt Sara came to pick me up. When Cathy returned, she first thought I had escaped. The door was open and I was gone. Then she realized Aunt Sara had come a little early..and the new door was on the crate! “I figured I might as well get that door on,” Aunt Sara said tactfully. My mom wants you to know it’s not age. Just the opposite. She’s much more dexterous now than she ever was. Now she knows what a Phillips screwdriver is, although I’m not sure I’d want to watch her try to use one. Yes! I absolutely agree. I came home with a note from the Barking Lounge, reporting what I’d done. I don’t fetch. But I did cuddle with everyone and I got some serious nap time and exercise. If that’s a vacation, give me more. Best of all I got to escape our feline housemates. Ophelia was very upset with Cathy. She’s strutting around the apartment, emitting yowls of discontent. Creampuff of course is so ditzy she didn’t even notice anybody was gone. Now I’ll get to hear Ophelia’s story. Just what I don’t need. Time for another nap. I guess life could be worse and anyway I need to spend the next week or two acting Very Grateful For My Owner. Cathy just saw the boarding bill. “Might as well send you to the Four Seasons,” she said. Yes. Definitely not a week to press the mom for extra treats, let alone a winter coat and those cute little booties. If the mom won’t wear high heels, and she loves her ancient parka, we know who’s not getting a new wardrobe this year. How To Teach Physics To Your Dog, by Chad Orzel. My mom would have answered, “Yes, no and yes.” I would have turned her down flat. And look what’s happened. I have taken over the couch. I sleep on my own cushion on her bed. And I’d never have asked, “Will I sit on your lap when we ride the bus?” After all, until i was adopted, I hadn’t even seen a bus. All those things have contributed to my existence as a thoroughly spoiled dog, my mom would say. A properly appreciated dog, I would insist. Emmy must be a pretty smart dog to learn physics. I have all I can do to watch my mom try to make cylinders in the pottery studio. So maybe Emmy knew the right questions to ask. I’m glad I didn’t. Sometimes you just have to take chances, my mom said. This time she was right. Well, after my mom picked up a few books from the library, we walked over to the Queen Anne Community Center. I had been in here briefly, when we went to the Farmers Market. But now we went into a room I’d never seen. It was horrible. I hate shiny, slick floors. Mom had to pull me along. “We just want to see how the pottery turned out,” my mom said. Great. Just what I’ve always wanted. So here I am, waiting again. This is the part of a Dog’s Life that nobody wants. My mom admires Connie Green, an Internet empire builder. So when Connie organized a pre-conference get-together, Mom flew in to join them. She left on a 6 AM flight and arrived on time in Las Vegas. The group posed for a photo. Connie’s in back, wearing pink, with a big warm smile. Mom’s the one on the far right, wearing a hat. She’s crouching down just a little so people can see the folks behind her. Nobody dresses up because they all work from home on the Internet .Some of them don’t even have suits anymore. What do I know? I am a dog, remember? I think she looks fabulous when she’s got a hand out to give me my treats. This morning my mom was awakened when I bumped into her bed. I was trying to jump up and return to my assigned cushion without waking her. After all, I got down, didn’t I? So my mom gets up, suspicious from the get-go. Come on, Mom. You’re a softie when it comes to human justice. You don’t believe in convicting criminals based on circumstantial evidence. So why me? Mom’s always saying the justice system picks one suspect and ignores other possibles. Well, let’s consider Ophelia as the Prime Suspect. Ophelia’s been getting MUCH larger. She eats fast and furiously. She looks like a plate-cleaner to me. And who knows? Maybe I just thought you were ready to wake up and leapt off the bed two seconds before you woke up. Busted…or falsely accused. What do YOU readers think?